At Gettysburg, I work for the Gettysburg Recreational Adventure Board (GRAB). The organization is focused on experiential education and uses the outdoors as a medium for teaching and imparting lessons on groups that go through our programs. I am excited to see that the US Green Building Council (USGBC) uses the same experiential teaching methods that I have been taught in GRAB and which I employ during trips and challenge courses that I run for Gettysburg. Higher education has begun to place emphasis on new learning methods and on remodeling existing or building new environmentally sound buildings with the LEED certification. USGBC has wholeheartedly embraced this idea and created a learning curriculum that combines the teaching method of experiential education with a two semester course (LEED Lab) that prepares the student to take the LEED Accredited Professional and Green Associate exams at the end of the two terms. In addition, while learning the system, students can attempt to certify a building on their own campus. This methodology by schools benefits both USGBC and universities by providing USGBC with a new cohort that could work with LEED in their postgraduate field; and it gives the schools a new way of saving money through newly certified environmentally friendly buildings. Finally, the use of experiential education can create a more deeply committed student who worries about both, the environment and their schoolwork. The USGBC is providing this two semester course that is spreading rapidly through the United States and the world. Since 2013, LEED Lab has spread to twenty-five institutions of higher education in multiple countries. An additional one hundred schools have expressed interest in the education course. At this point there are nearly eight thousand projects participating in LEED Labs. All of these projects provide students with an abundance of new skills to apply to post graduate work. It is the belief of USGBC that “by gaining practical experience in green building and earning their LEED GA and LEED AP credentials, LEED Lab students graduate with an advantage” (Buente). This advantage better prepares students for the Green Associate and Accredited Professional exams and certifications that follow through practical learning. The LEED Lab provides the students with the training and experience necessary to apply for and achieve a position in the sustainability field after graduation. This experiential methodology in teaching the LEED Lab provides great benefits to USGBC. 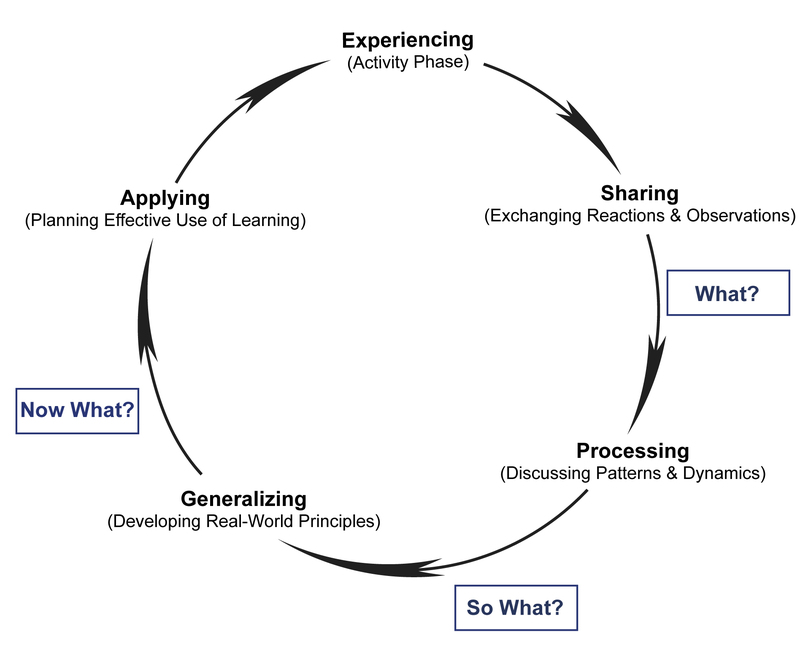 Experiential education can be expressed as a cycle. This cycle can be simplified into a group that does an activity then proceeds to have a discussion about the activity that revolves around “what happened, so why is that important, and now what happens?” After the discussion the activity is repeated again with slightly changed parameters. This method of teaching and review provides USGBC with an excellent way to review their LEED Lab program. The organization is able to document data and feedback from a global range of projects and locations. USGBC may then modify the new guidelines for the lab from this vast amount of information and can tailor particular projects to specific parameters or make changes to the new versions of LEED that come out. Through USGBC’s experiential learning cycle they are able to apply new ways of thinking to improve their LEED Lab. This lab creates a new group of post-undergraduate students who are able to leave school and immediately take the LEED AP and GA exams. This new influx of people in the industry provides a greater wealth of talent to improve work and a wider audience to expand the LEED program to an even higher level of participation in higher education and through the rest of the world.